Les Fiefs Vendéens Four wine areas in particular : BREM, MAREUIL, PISSOTTE and VIX , were duly recognised by the wine authorities and attributed the AOC (Appellation original controlee) label of quality. Benefiting from more sunshine than the national average, the White, Rose' and Red wines from these four areas are wines with delicate bouquets with completely different fragrances. The wines from the Brem area are produced from two different grape varieties called Groulleau Gris and Chenin, they are limpid and soft wines with a very often discreet apple aroma. Situated more to the south east, the small vineyards of Vix and Pissotte produce full-bodied wines, They are made from the same types of grape varieties as the wines from the other areas, but to which are they add Sauvignon in the Vix region and An Melon in the Pissotte region. To the north of the Vendée there is wine grown that meets the AOC quality and yet other areas that produce wine in the lower Vin de Pay and Vin de Table category. These are the official wines, but those who live in the Vendée tell of a different breed of wine. In the late 1900’s France lost most of her vines to the Phylloxera. The government decided to destroy all of the vines and re-import new vines back from California and South Africa in the varieties that originally existed so that they could continue with their traditional wine production. I'm informed it was at this time that Appelation controlee was introduced to firstly control the grape varieties that went in each distinct wine, but secondly to control the amount that was produced, thus keeping the price up to pay for this work. The Vendée didn't grow many grapes and it seems that Phylloxera didn't affect those that tey did grow, and being good farmers they didn’t destroy what wasn't affected. These vines still exist today and are the true Bordeaux’s. They are said to be very Fruity and the reds are dark in colour, so much so that they say the glass turns blue when washed. The other striking feature is that most of the wines produced from these vines have an alcohol content of up to 18%. The stories of these wines that you hear whispered about in quiet corners say that they are called Vin-Fool; because once you start drinking them you do not detect the strong alcohol content in them so you drink more than is good for you. I recently asked an old farmer about them, and he told me that there were quite a few different wines. The two whites he mentioned were Noah (the myth is that Noah came ashore and planted his staff, this took root and became a vine). The other was Castell white, so I presume that there must also be a red. The reds he mentioned were Oberlin and Jurassian. (I'm not sure of the correct spelling). It seems there is no rose. It is said to be illegal to grow and sell these grapes so I'm not sure where you can get to try them out other than quietly ask the older man in the small villages, you may be lucky, if they take a shine to you. As I am no longer able to drink (damage to liver caused by too much medicine after a back operation) I have little interest in chasing this one. There are wines more generally available from locals once you get to know them, there are the imported vines, still quoted in their number formed. One I tried a few years ago was Dix Huit Mille (18000),it is a bog standard Bordeaux wine of about 12%. Again you can’t buy them to my knowledge but often you will be given the chance to try them. Pineau Most people will have heard of Pineau from the Cognac area. It was originally started by a man from Jersey who came to the Cognac area to produce a fortified wine to compete with Sherry from Spain and Port from Portugal. He never succeeded in his quest but the distilled alcohol of the wine, Eau de Vie, become a world beater as the Brandy we know as Cognac. 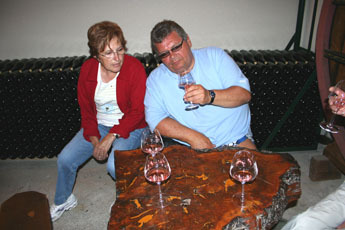 Pineau uses Eau de Vie to fortify the local wine and is an excellent drink. The south Vendée is just in the Congac area in a region called Bois de Cognac, and the older men are still allowed under permit to have their unusable alcohol leftovers distilled to make Eau de Vie. With this Eau de Vie the locals make their Pineau, these vary greatly with many having additives such as walnuts and cherries added to give a distinct flavour. Vendée Pineau. The True Vendée Pineau is not a fortified wine but a fortified fruit juice, made from one of the old grape varieties, the moment the juice is extracted the Eau de vie is added to stop the fermentation. It is kept in oak barrels for the winter before being bottled. I have never heard of these being available commercially although if you go to a dinner party with the locals you will often be given a glass as an aperitif. These Pineau's are exceptionally fruity and the locals claim the finest is made from the Noah Grape. It seems this method does not work so well with traditional grape varieties. Whatever the area, all these wines are cultivated with love by each grower and the spirit of the country seems to sing in the bottle.